Probably the only thing that most people know about Devil’s Third is that it’s been in development for an unusually long time. Valhalla Game Studios’ debut started life as an Xbox 360 and PlayStation 3 game, announced in late 2011 by publisher THQ, which has since folded. Back then, it was still a game that combined melee action and shooting elements (as it does now), but it featured two characters: an agile woman and a man with slicked-back hair, both sporting snakeskin jackets. It looked slick, fluid and gory, with stylish combat and some simple parkour elements. Four years later, the gore’s still there, but not much else has survived. Despite how long it’s been in the oven, Devil’s Third is half-baked. In some respects, that’s not surprising. It’s already endured three changes of game engine, a problem with which even the most well-resourced studio would struggle (as evidenced by Duke Nukem Forever). After THQ went under, Devil’s Third was unexpectedly resurrected in 2014 by an unlikely ally: Nintendo, which would help Valhalla finally get Devil’s Third out the door as a Wii U exclusive (except Devil’s Third isn’t actually exclusive to Wii U; only its single-player campaign is, with the game’s multiplayer component set to be released as a ‘free-to-start’ title on PC, powered by micro-transactions). The reason I mention all of this is not to excuse the game’s flaws, which are manifold. But it’s fair to say there are mitigating circumstances. No player will be in a particularly forgiving mood after sitting through Devil’s Third’s campaign, though. It squanders a promising narrative setup that centres around the Kessler syndrome, a theoretical scenario posited by (and named after) a NASA scientist that satellites in low Earth orbit could collide with one another. This could, Kessler argued, produce a domino effect, whereby debris from these collisions would knock out other satellites, creating a dense field of space junk that would potentially inhibit both interstellar travel and the introduction of new satellites. It’s an interesting idea, used here to power a simple terrorist plot, with a group calling themselves the School of Democracy (or SOD for short) using a giant EMP to render all electronic equipment useless and force their western enemies to rely upon low-tech weaponry. To save the day, the US government calls upon an erstwhile member of the SOD, now serving an 850-year sentence in Guantanamo Bay after balking at his colleagues’ use of chemical weapons on civilians. Ivan, a prodigiously tattooed Russian with a cushy cell in which he practises indulgent drum solos, is evidently a capable fighter, and that’s apparently sufficient reason for him to lead the military operation against an organised, powerful and suspiciously well-funded foe. What follows is fairly rote B-game fare: a series of missions that conclude with a boss fight against a former ally, each of whom practises a different form of martial art. These encounters would be more meaningful if the narrative put any effort into establishing these characters. But barring the occasional flashback, they’re usually introduced seconds before Ivan is tasked with killing them. It’s a pity, as some of them are strikingly designed, most notably the beret-sporting, Cockney-accented Grundla Saha, who is also one of the trickiest opponents. The missions themselves combine shooting and fighting about as effectively as oil and water. Neither discipline impresses individually, either: aiming down iron sights feels stiff and awkward, and close-quarters combat with swords, pipes and axes feels…well, similarly stiff and awkward. To compensate, enemy AI is set to ‘toweringly stupid’ – those with guns will constantly leave themselves horribly exposed, striding blithely into a hail of gunfire (presumably they’ve been told about the dodgy aiming), while anyone with a sword or similar is usually kind enough to let Ivan attack first. You’ll be overwhelmed at times by their sheer numbers, or when the difficulty ramps up and you’re facing heavily-armoured hulks with miniguns and chainsaws, or distant grunts wielding RPGs or sitting behind turrets. Otherwise your greatest danger is complacency: it’s easy to assume you’ve cleared an area, only to blunder into trouble as a previously inactive soldier suddenly decides to avenge the bloody deaths of his comrades instead of pointing his gun at a wall, or crouching behind a box. That’s assuming he’s not hovering a couple of feet off the ground, like the twitching lower torso of a man I recently sliced in two. 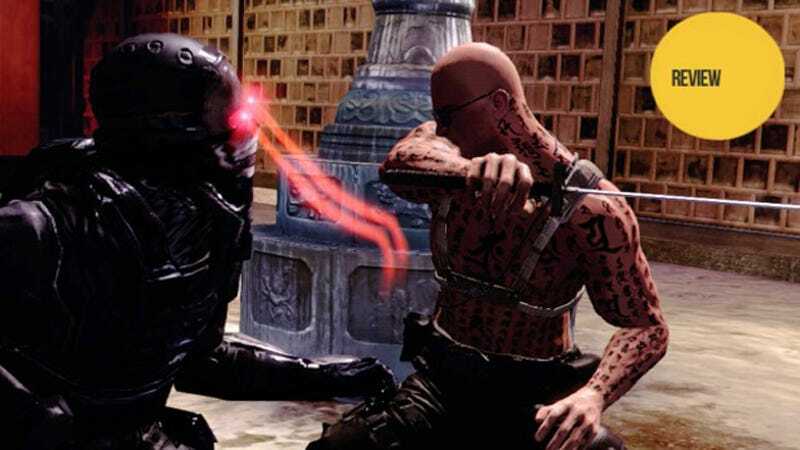 Glitches aside, Devil’s Third follows the template of every low-rent military action game released in the wake of Call of Duty: Modern Warfare. There are set-pieces where Ivan has a brief sit-down and fires rockets or volleys of machine gun fire at a group of enemies. There’s a sequence where you have to fend off enemies while a man takes an inordinate amount of time to open a door. There’s a driving section that’s so laughably inept it beggars belief, as you wrestle with sub-Warthog handling to drive in a straight line while occasionally shooting helicopters and running people over. The frame-rate varies wildly, occasionally hitting 30fps, but frequently settling for significantly less. Most explosions trigger a Ray Harryhausen-style stop-motion effect, which is usually more interesting than anything else that’s going on. It is, at times, moreishly bad. You’ll stick with it because you’re curious to see what cliché can be dredged up next. Ivan’s unflappability in moments of extreme peril makes him almost likeable, and his slide move – which has basically been nicked from Vanquish – is oddly satisfying, particularly when you somehow manage to skid up a flight of stairs. And some of the boss fights are quite entertaining, even factoring in a camera that struggles to cope with nearby walls, and the odd one-hit-kill attack. Once or twice, I felt like I was beginning to enjoy myself, even if that was at the game’s expense. In the unlikely event you fancy another shot once the credits roll, a score attack mode encourages you to replay stages against the clock, with score rewards for stylish kills, headshots and combos. This might have been a reasonable idea had the levels not been quite so tediously long, though at least this time you can skip the cutscenes. The campaign has evidently been worked over many, many times, to the point where it feels like Valhalla lost any enthusiasm for reassembling it. The same can’t really be said for the multiplayer, in which the studio has clearly invested a good deal more time and effort. It invites you to join one of two factions battling for control of a United States in disarray, or to ply your trade as a mercenary, fighting for whichever side will have you. You can create or join clans, forging or breaking alliances and no-war pacts. To begin with you’ll need to play a lot of free-for-all matches to reach Level 5 before the more expansive and interesting Siege mode becomes available. You begin with a small amount of Dollen, the game’s currency, and 30 Golden Eggs. Each of these can be exchanged for 100,000 Dollen, allowing you access to some high-quality ordinance from the off, but not the more useful outfits, which convey a range of perks. You can pay real money for more Golden Eggs, though it’s not really necessary. You’ll also get them for certain accomplishments, and every time you level up. Once you’ve chosen a primary weapon, a sidearm, a melee weapon and a grenade type, you’re ready to go. Each multiplayer session allows players to vote between two maps, and there’s a reasonable selection, taking in canyons and wetlands, factories and Badlands. Up to 16 players can take part, but during the online slots Nintendo had arranged for reviewers, I rarely came across more than a handful per match. Three players are required before a game can begin, or six in the team-based modes, but the maps are so large that you really need more than that if you don’t want to spend minutes running around trying to find someone to shoot. But then, a full complement of players is too many: it’s chaotic enough with 8-10 players, let alone 16. And yet whichever mode you’re playing, whether you’re in a melee-only match or competing to throw fruit into a smoothie maker (being careful not to spoil the taste by diving in yourself), the online game is fatally compromised by the fact that it’s built upon the same shaky foundations as the campaign. Your opponents are more intelligent, of course, which brings several new issues to light. Take, for example, the decision to map both slide and crouch to a click of the right stick, the action contingent on your movement speed. Given that climbing and jumping resets you from a sprint to a jog, you’ll sometimes find yourself attempting to slide into cover while under fire, only to haplessly waddle into harm’s way. The sluggishness of the evasive roll and the slight pause that follows a hit from a bullet or melee weapon gives you little chance to respond, meaning whoever attacks first in a skirmish is almost certain to win it. And once a player has earned enough points to unlock their X-Gear (a one-hit-kill grenade or rocket launcher), any consideration of balance has completely left the building. Strangely enough, for a game that prides itself on bombastic action, the best strategy appears to be crouching behind cover. Only by running, climbing and firing will you show up on the radar, so it’s often wise to hide and wait for someone to sprint by. There are some fine ideas here. Siege mode, which has you attacking enemy bases and defending your own, can be rather satisfying, especially when you spot a rival about to infiltrate your post and you hit the button that triggers a shower of poison gas. Your clan has its own personal supply of Dollen, and this can be used to reinforce your base, or to buy choppers and airstrikes to call upon when you launch an offensive. But reaching that stage requires a level of patience and leniency that will be beyond most players. Even setting aside the game’s intractable issues, it tests your resolve in a number of ways: like having to wait a full minute after map voting has finished before a game can start, or sitting through the long load times after each match while your character information is updated. And while I’d recommend using a Pro Controller rather than the GamePad, it’s baffling how poorly served the latter is. The display shows a series of tappable icons, allowing you to exchange Golden Eggs, view your player card, or read the messages in your in-game inbox. Yet once you’ve selected an option, touch features are disabled, forcing you to use button commands to navigate the other screens. Then, when you want to send a message to clan members in the chat room, the stylus becomes active again. These might seem like minor quibbles, but the fact that Devil’s Third gets even very basic things like this wrong demonstrates what a dysfunctional mess it is from top to bottom. Heck, even its logo is old hat, its silhouetted characters performing actions that no longer exist in the finished game. Still, there’s one thing about Devil’s Third that does fit. Its name derives from ‘the devil’s interval’, a musical term describing an atonal three-note sequence designed to provoke a sense of unease in the listener – in other words, a series of familiar elements combining to make something unnatural. Itagaki and Valhalla might not have got much else right, but they could hardly have come up with a more perfect title.